Any Neopian Times writer will agree with me when I say that readers will ask just about anything in their fanmail. I once had someone ask me what my favorite color was. How that was relevant, I never asked. One of the most common questions I see is: what inspired you? A question that I find quite hard to answer. Sometimes ideas just pop into people’s heads. Sometimes another writer inspired their writing. Sometimes a question asked by someone else, a ‘what if’ question, for instance, makes ideas come rolling. But what sparks your story? Here’s a guide for aspiring young writers and even brilliant masterminds of the ‘Times to help you spark. Even from the beginning, a character can start any story. Say you want to make a happy tale of friendship and love. It’s time to create Missy the yellow Acara, and make the story revolve around her and a wonderful day in Meridell! But perhaps you’d rather make a depressing, dark, and intriguing series about magic and mystery. Maybe Nevare, the Darigan Lupe. Create his traits and the story will rocket onwards. Maybe you have absolutely no idea what your story is going to be about. You just want to write a story. Create a few characters, all with different lives yet connected, and see if anything unfolds. If not, try focusing on one character and seeing how others fit in here and there. Trust me, anything can begin and end with a well put together character. You’re sitting on the bus on your way home after a long and tiring day of school. As you stare out the window in boredom, words from the surrounding shops jump out at you. The points that signs and advertisements are attempting to make seem to fade as the words printed on them become clearer. What’s this all about? Why, the words are trying to tell you something. Or maybe you’re so bored that you’re imagining things. Hmm… works of art can come and live at your house? Or maybe a famous painter is coming to visit? Maybe any famous person is coming! Could your aunt be Kauvara? Or is Queen Fyora lost and seeks shelter at your home? There you go, two interesting topics formed from a simple advertisement! For me, a whole series was formed from a title I thought up. Making up any old title, such as Ally’s Super Day, isn’t really worth it. But others can be. Remembering the Riddle, Alstaf’s Words, and A Stolen Secret all are creative and intriguing titles, they just don’t have a story to follow up. Now you can write the story! Using words, like in step #2, can also inspire a title. Say you make up a title that doesn’t give you any clues about its characters or background. For instance, Scheming, which I find to be a very mysterious and awe-inspiring title. Now, you have no idea who or what is scheming, who are the characters, and what’s going to happen! This is where the writing and creativity come in. If you find it too hard, I’d suggest you select a different step for sparking your story. This is definitely not a method I use often, but a lot people find it helpful. When you know you want to write a story, but you can’t decide what to do it on, you can think a little about your life. Or, if you’d rather not have your life, see if you can base it on a friend’s. Remember: if you take an experience from your life and set it to Alice the Zafara, it is not technically a character based on you. It is character based on experiences that you can relate to, which is very different. It is possible to base a character on you, though. If you do plan on doing that, pick a pet or type of faerie that you enjoy, and it’ll run your personality a little more. This is one of those methods that are for when you have tried everything else and just can’t seem to get any inspiration. If it is a Neopets story, type a random word in the search box and see what comes up. For instance, type book. One of the results is a TCG Card labeled Book of Sadness. What exactly is this? Could maybe an innocent little pet pick it up and uncover secrets? For another one, type rainbow. One thing that comes up is a Rainbow Chia Gumball. Its description says, ‘This multi-colored chewing gum is a mixture of 15 different flavors!’ Could there be one magical rainbow Chia gumball out there? Will someone evil find it, and discover its powers? Just play around with what you find, because this really works! Doing this, I was able to write a really good series. This is another good method that I used for my series. There is generally two sides: evil and good. Maybe you can create a few evil characters and a few good characters. Maybe make them brothers and sisters. Conflict? I think so. Then add some twists. A few of them switch sides meaningfully, and then come back to their original side. Maybe one goes to the opposite side and stays. Maybe one becomes a spy, and pretends to go to the other side. Another way to do this is pick real Neopian characters. I’m sure we all know two rivalries right off the bat… Illusen and Jhudora. I love exploring the ‘Times and looking at the custom pictures. A whole story can be inspired from looking at that small square above the story. 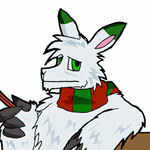 Let’s say that in a certain picture you see, there is a Zafara, a Cybunny, and a Kyrii. They are standing on a grassy hill and surrounded by Babaas. Maybe the actual story is an article about Neogardens, or caring for your Babaa. But something quite different can come from that. All of a sudden, Marie the Cybunny, Araina the Zafara, and Lornard the Kyrii are created… along with a dramatic tale of a Babaa Farm and a certain evil Babaa-napping. The original article and the newly thought up story are of the same picture, but completely different once you read them! Try looking around and seeing if there are any pictures you like. Ask yourself something. Anything. Something crazy, something interesting... ANYTHING!! I like 'what if's' best, because they really make you think. What if Jhuidah fell into her cooking pot? What if the Island Mystic predicted something that made some sort of sense? What if Brucey B's lucky coin was stolen by... *insert name of evil villain here*? What if the omelette was eaten and another one never came back? Just say something random to yourself, and see what happens to the idea. Make crazy plot twists. Create unobvious clues. Just make something EXCITING happen! You want your story to become full of questions, and maybe end it without answering any of them. Some authors like to have their readers finish the story for themselves. Just make sure that you go with the flow. Many a time, I have created an unintentional idea in a story, and I don’t even realize it until later. Just allow the little Plot Bunny… or Plot Cybunny, I should say… to lead the way. Curve around obstacles, battle evil, blow up Neopia… do whatever! Make your story something that the reader won’t be able to forget quickly. Make your story… inspiring. Well, there you have it. A few varied methods to start a story, and start it with pizzazz. Just remember to keep it cool, go with the flow, and let your head take over. Yeah, letting your head control may lead to some disastrous events… but take the chance. If your story gets rejected, try again. And again. Never give up, and spark away!